Viewing the church from across the Piazza, you can see there are five domes. You have to look carefully because the center three are in a straight line, one behind the other, with the central one dominating in height. The five are situated with one at the center and the other four at the ends of a Greek cross. 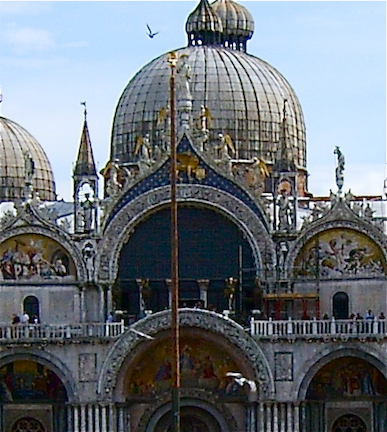 This follows the Byzantine tradition, since the Greek cross plan was used in Venice as an act of defiance against the Roman Popes. Traditional cruciform basilicas were the norm in Italy, except here in Venice and parts of Ravenna. The church itself is a mixture of Byzantine, Gothic, and Renaissance elements. 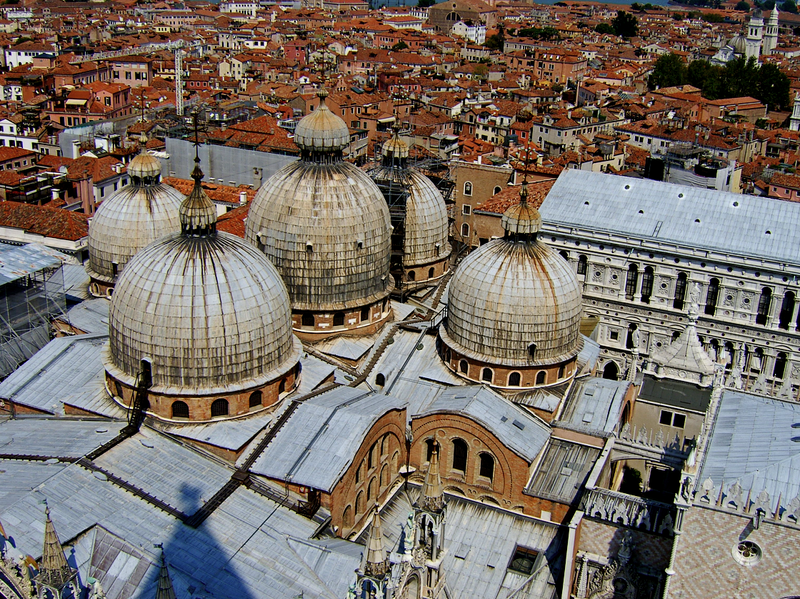 A better view of the domes taken from atop the campanile. These domes were covered with higher lead cupolas so that they could be seen from greater distances. The central dome is 13 meters (42') in diameter. 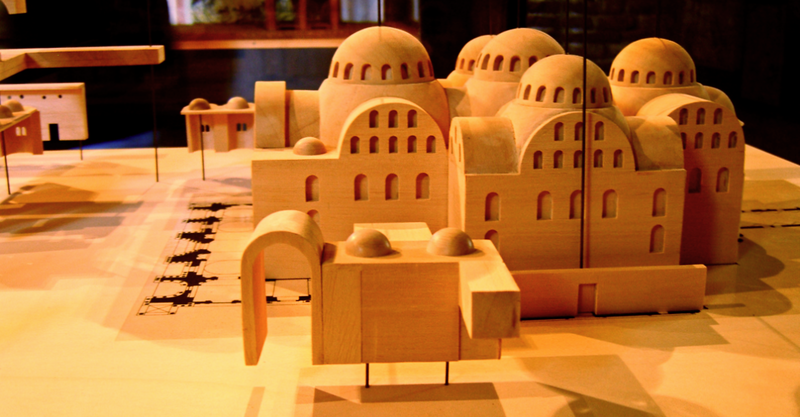 The domes were raised over the interior constructions in the 13th century; between what we will see internally and the exterior silhouette; timber trusses support lead-cladding of the higher domes. The construction immediately in front of the Greek cross is essentially the narthex of the church, the western entrance area. 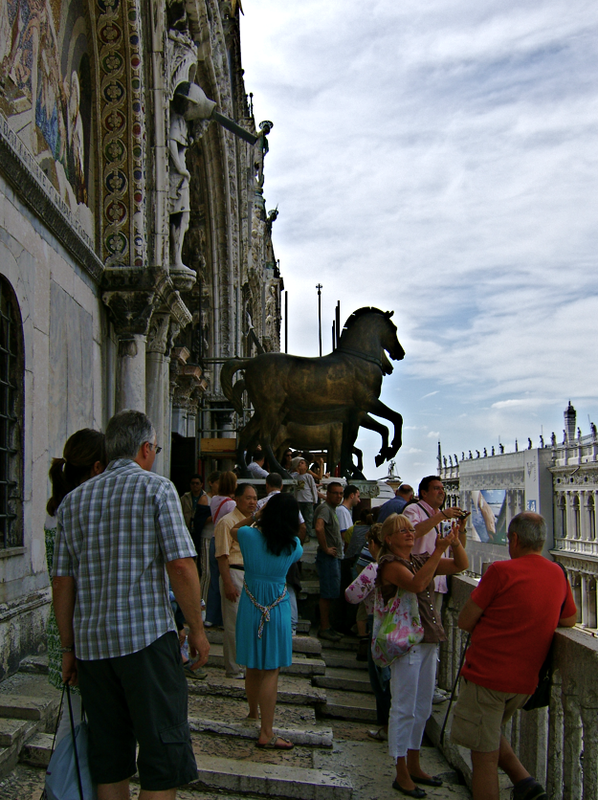 The four horses (described below) are visible, and the shadow on the roof is cast by the Campanile, from which this photo was taken. 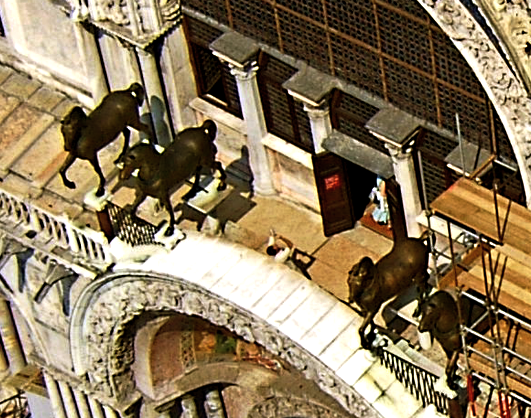 Zooming in allows us to view the four bronze horses, situated on the Loggia dei Cavalli. In fact, a model should help. Mosaics were begun in 1071. 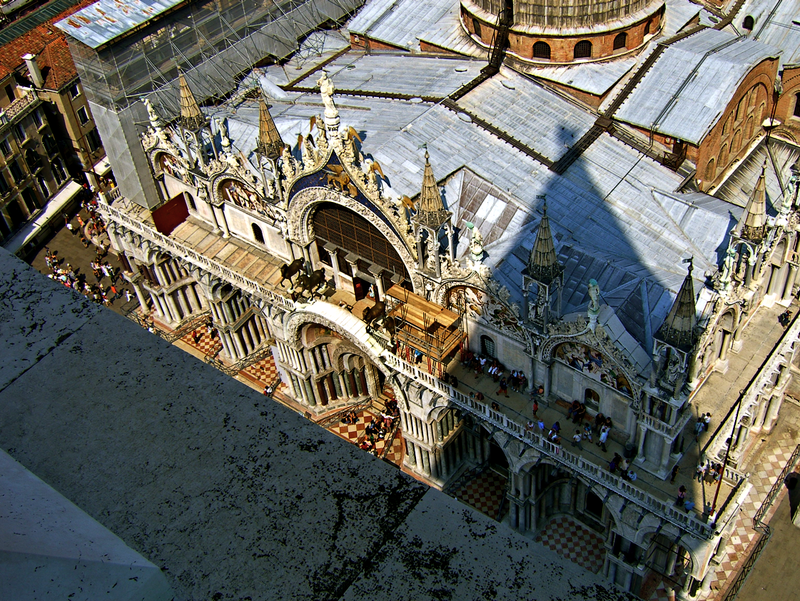 The facades were faced with polychromatic marbles in the early 13th century, many “rescued” from the Fourth Crusade's conquest of Constantinople. Modifications, enlargements, and decorative elements continued into the Renaissance. Do notice the golden winged lion, symbol of Mark the Evangelist, situated in the blue background ogee arch, centered over the main arched doorway. To the north (left) of the church is a building, which serves as a clock and provides astronomical information. 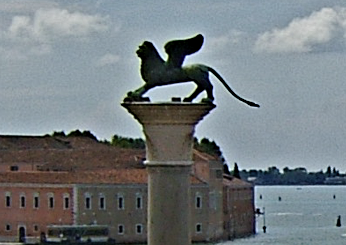 Notice the symbol of Venetian power, the winged lion again. 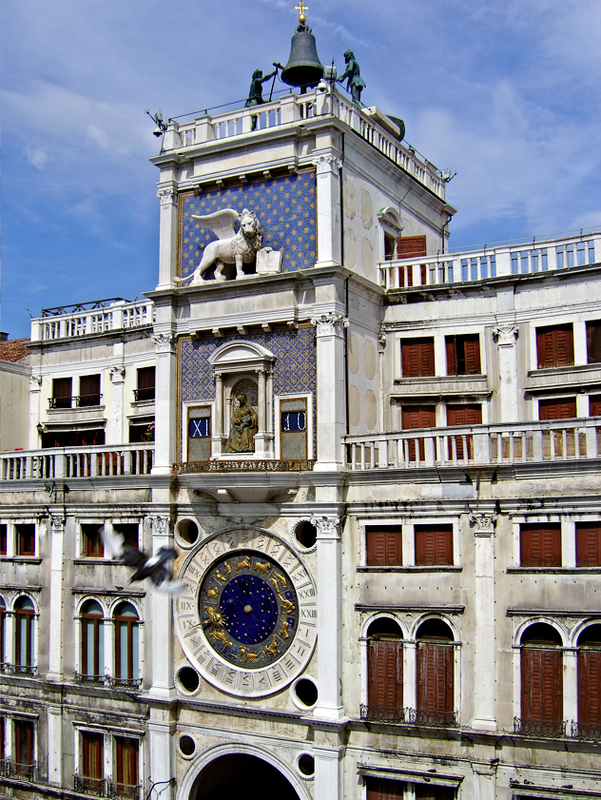 The building is the Torre dell'Orologio, and dates from 1497. More next semester, since the design can best be described as Italian Renaissance (note the semi-circular arches which came back in style after the pointed Gothic had spent itself). 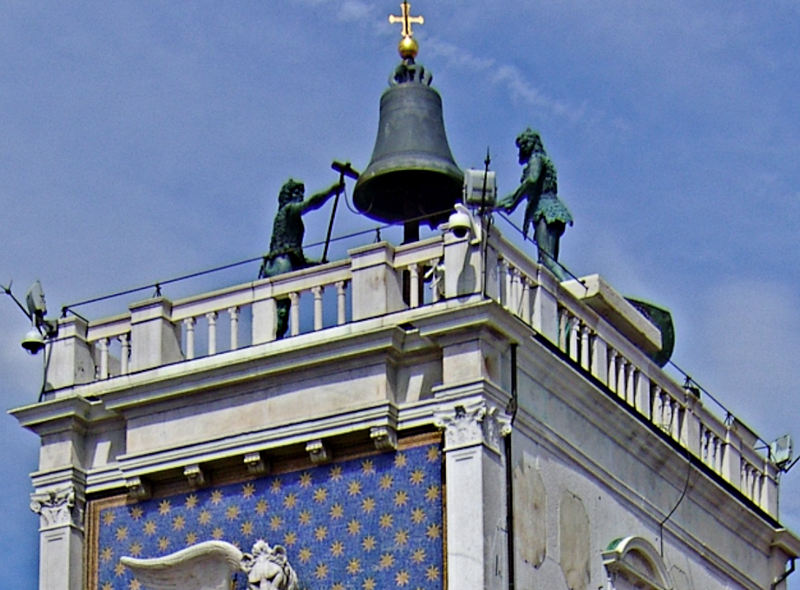 Two bronze figures strike a bell on the quarter hour, and add not only information, but sound and decoration as well. The place is a festive event, all day and night. 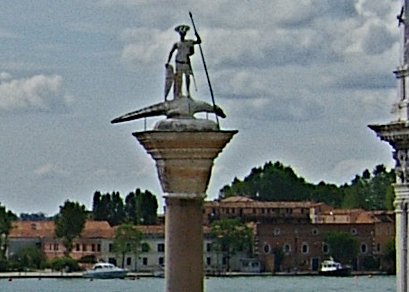 To the south (right) of the church is the Piazzetta of San Marco, a smaller space opening to the lagoon of the Adriatic. This has been the ceremonial landing spot for V.I.P. 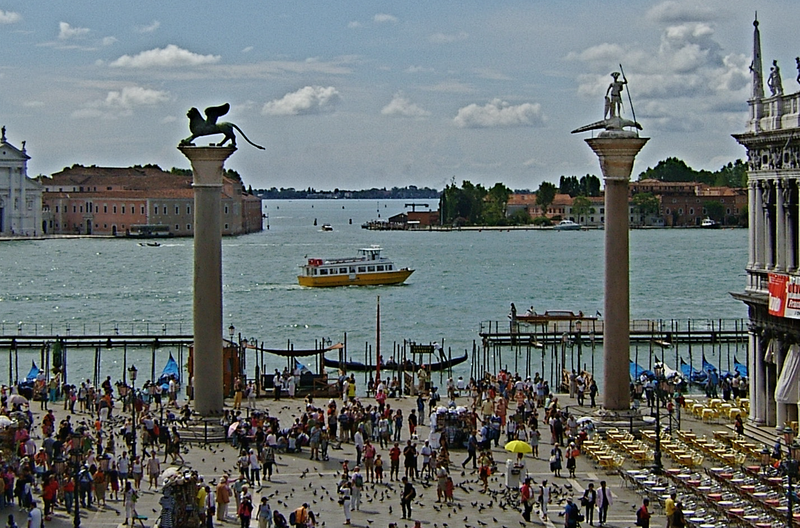 's visiting Venice, and could be thought of as the “front door” to the city. 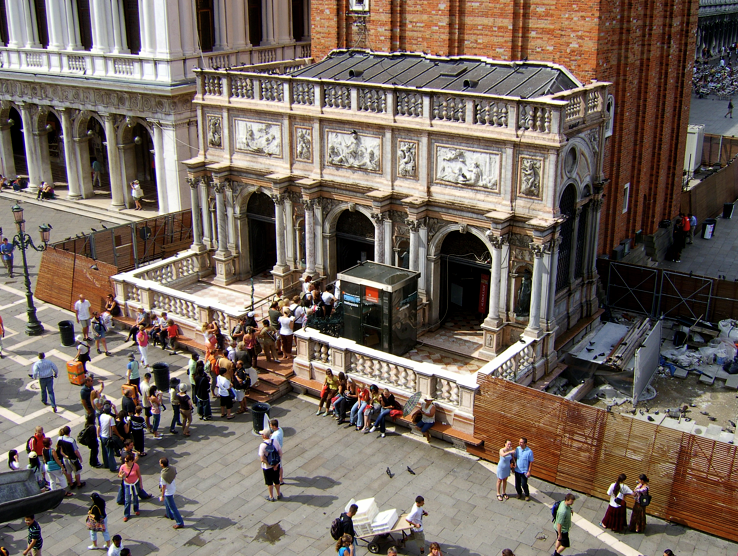 On the right of the Piazzetta (west) is the Library of San Marco, formerly home to the nine Procurators (chief officials) of Venice. It dates from 1563-53, and is Renaissance in design. and the other a statue of St. Theodore, the first patron of Venice. 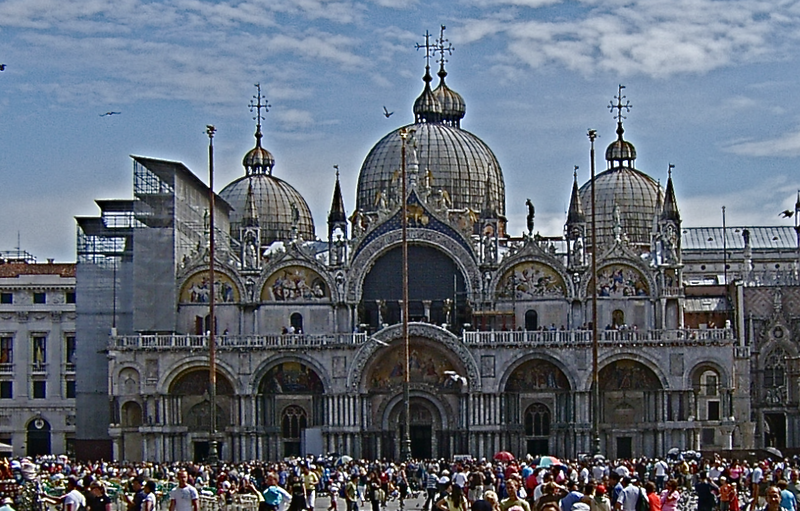 The memory of St. Mark took over that position, when his remains were smuggled into the city. 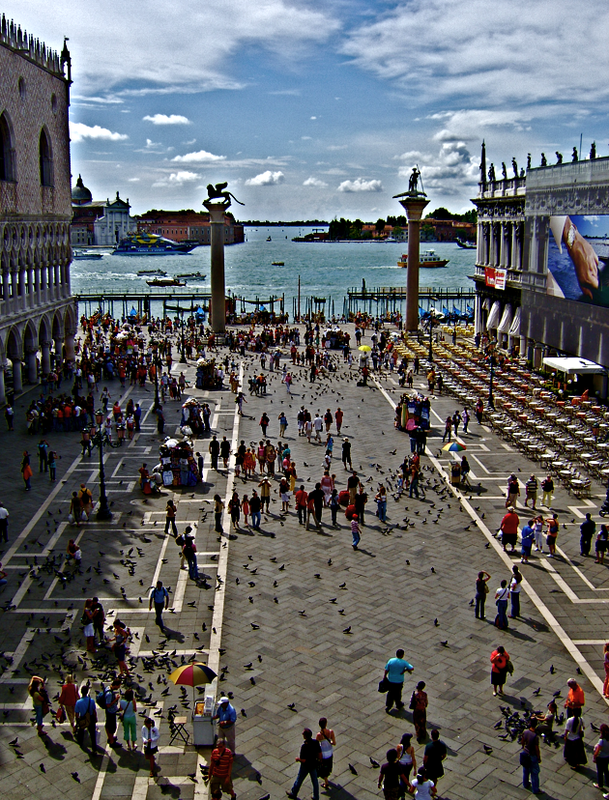 The Piazzas are alive with people walking, standing, sitting, buying, eating, and drinking. 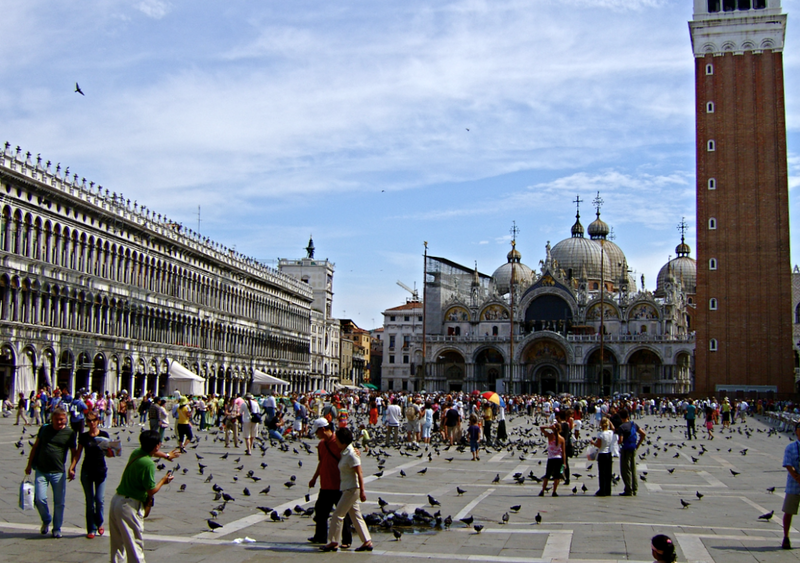 The Piazza of San Marco is not only one of the most beautiful places on earth, but one of the liveliest. Italian coffee and pastries are unmatched, anywhere. And, I am afraid, unrivaled, price-wise. Here we are walking above the entrance or narthex, where the quadriga copies have been placed, taking spots of the originals, which are now immediately inside. 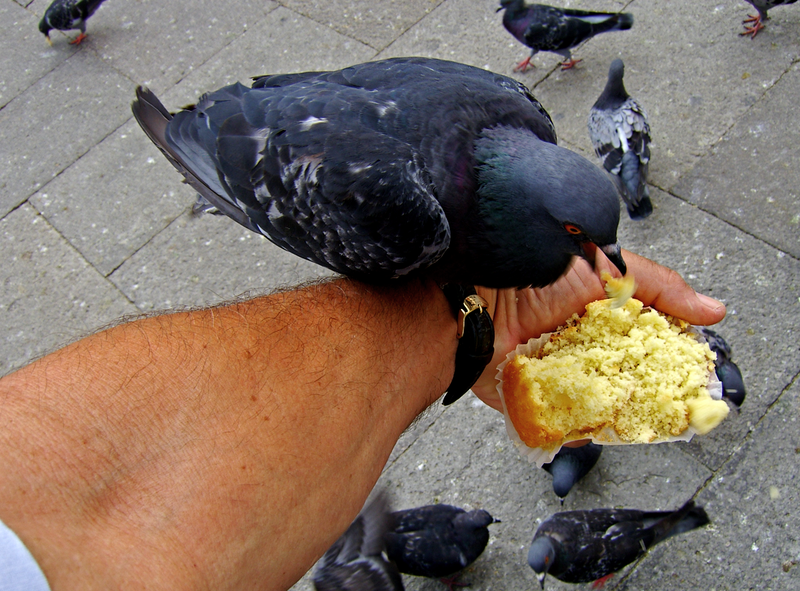 And the pigeons must be fed, too.